The Collect fair dedicated to modern craft and design opens this week at the Saatchi Gallery in London (28 February-3 March) with a special section dedicated to specially commissioned works, some of which reflect politically charged topics. Organised by the Crafts Council, which promotes crafts in the UK, the 15th edition will include 40 galleries such as Wannmul from South Korea and New York’s Todd Merrill Studio. The Collect Open section is a platform for 15 artists and artist collectives to show conceptual works, with a selection touching on current concerns. The Iranian-British jewellery designer Sara Peymanpour will show an installation called Hejab Art. “The headpiece represents the hejab [hijab] that has been imposed on Muslim women by tradition in most parts of the Islamic world, or by law in Iran and Saudi Arabia,” she says. Peymanpour says that the work is made of geometrical golden pieces and set with colourful stones, adding that the pattern resembles the colourful mosaics and stained-glass covered doors of mosques in Iran. “It seems to be heavy but wearable… Its heaviness represents the weight of cultural and religious limitations of hundreds of years. It is a golden cage,” she says. Meanwhile, the UK ceramicist Charlotte Mary Pack has made a piece comprising 100 elephants in porcelain to highlight the victims of poaching. All of the works were made on 4 December last year (world wildlife conservation day). “According to George Wittemyer’s study published in 2014, which provided the first reliable content-wide estimates of illegal killing for ivory, approximately 100,000 African elephants were killed by poachers between the years of 2010 and 2012. That is the equivalent of roughly one elephant every 15 minutes, which is what I created using porcelain in 24 consecutive hours,’ Pack says. The UK artist duo Sophie Thomas and Louis Thompson will show a piece entitled Broken Ocean which ruminates on the issue of ocean plastic. “Working with hand blown glass and waste glass fragments, found ocean plastic from Hawaii and other beaches around the world and recovered ghost nets, this series of pieces references the chaotic beauty of an entangled ghost net being pulled out from the deep ocean,” they say. 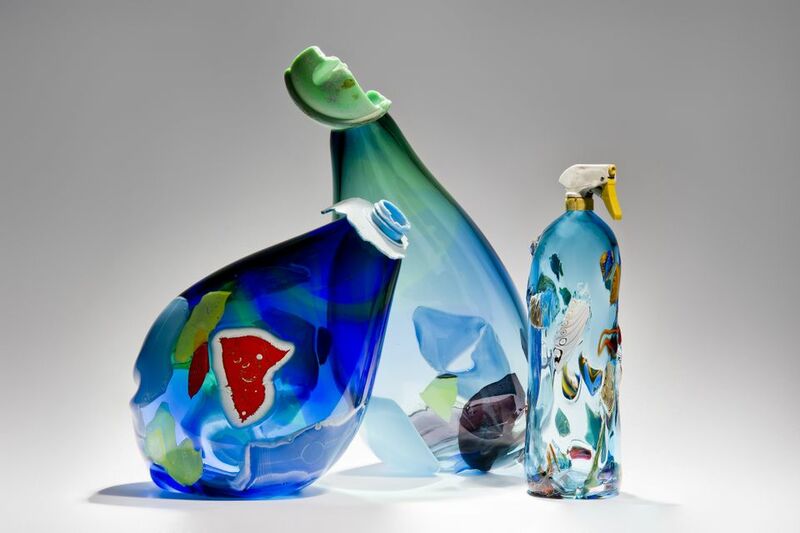 Works on show include hand-blown glass bottles with waste glass fragments melted into the surface. The new Collect fair director Isobel Dennis says in a statement: “The growing recognition of how craft is the foundation for providing the skill and intellectual rigour behind new and contemporary work is to be celebrated.” Fair sponsors include the Loewe Foundation and the lighting and furniture designer Collier Webb.